Welcome to the weird, wild and wide world of Areaware. We say “wide” because Areaware make so many fascinating objects, we’re not sure which category to place them in. This New York-based studio of design aims to make your home objects as unusual as possible, while still retaining their useful factor – and get a laugh or jolt of surprise from you along the way. Stonehenge won’t seem so mysterious when you have a bunch of Areaware’s Balancing Blocks in the house – you’ll soon see that the most bizarre stone structure in the world was built by giants with balancing blocks of their own! …Well, maybe. We’re still not sure how Stonehenge came to be, but we know exactly where these faceted “rock” blocks came from! 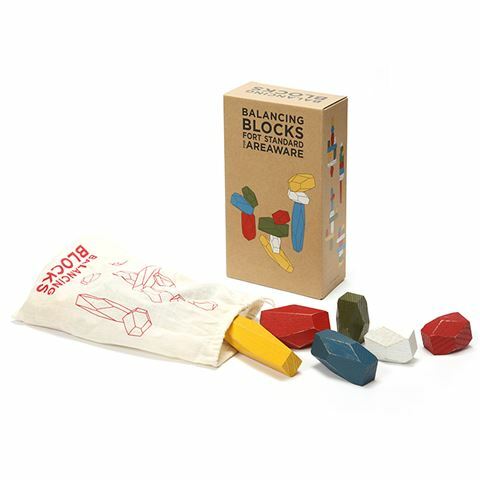 Designed by Fort Standard for Areaware, these multi-faceted oak blocks can be used to create colourful, tricky sculptures. Tumbled in non-toxic tints, they’re all packaged up nicely in a drawstring bag. Recommended for children aged 3 and up. Stack up, down and sideways to create a colourful sculpture. Includes ten faceted shapes in a drawstring pouch.